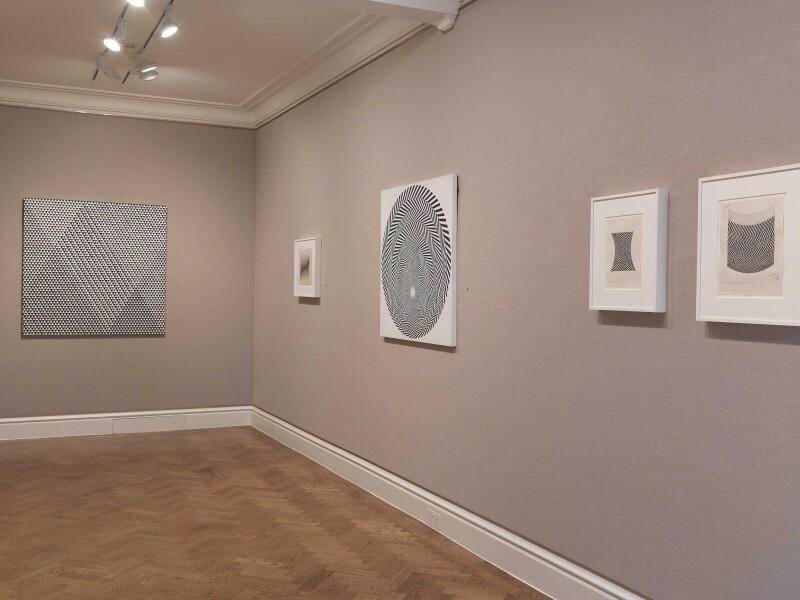 Bridget Riley: Works 1960 – 1966 marked 50 years since Bridget Riley's (b. 1931) first exhibition at Gallery One in Soho in 1962. It was the first exhibition solely dedicated to the artists iconic black and white works and included major paintings both from public and private collections, gouache studies as well as the complete prints. 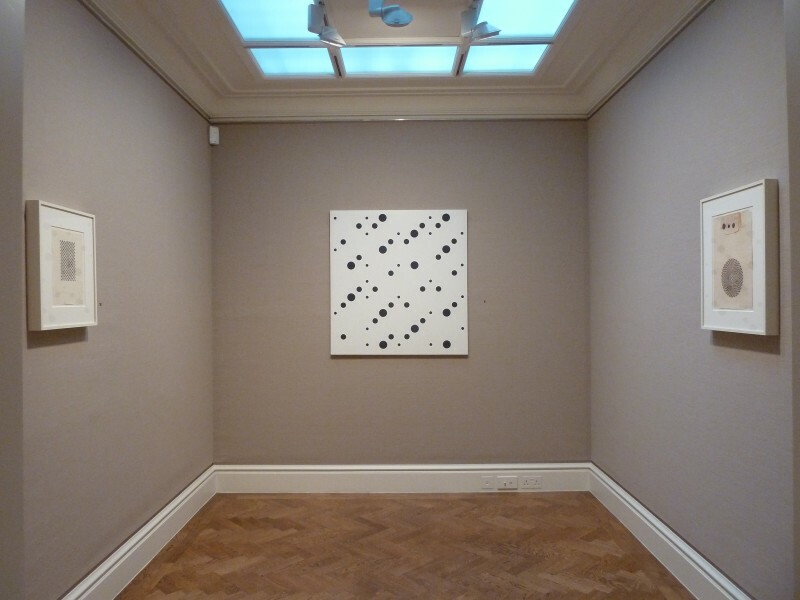 The exhibition contained a number of key paintings, including Movement in Squares (1961) from the Arts Council Collection and the rarely exhibited Dilated Centres (1963) from a private collection. Showing for the first time ever, was a group of studies that predates Kiss (1961), the painting which Riley considers her breakthrough work and is represented in the exhibition by an important study. The show also included all 14 black and white prints, including Primitive Blaze (1961) and the complete set of Fragments from 1966. Riley’s paintings from the 1960s are amongst the most iconic images of the period, and the artist’s beginning is now part of art history’s yore. Sheltering from the rain in the doorway of Gallery One in London’s Soho, she was asked in by the owner, Victor Musgrave. Riley then invited him to visit her studio, and a few months later she had her first solo exhibition at the gallery. The following years were a period of intense artistic exploration during which time Riley laid the foundation of a career that today spans five decades. 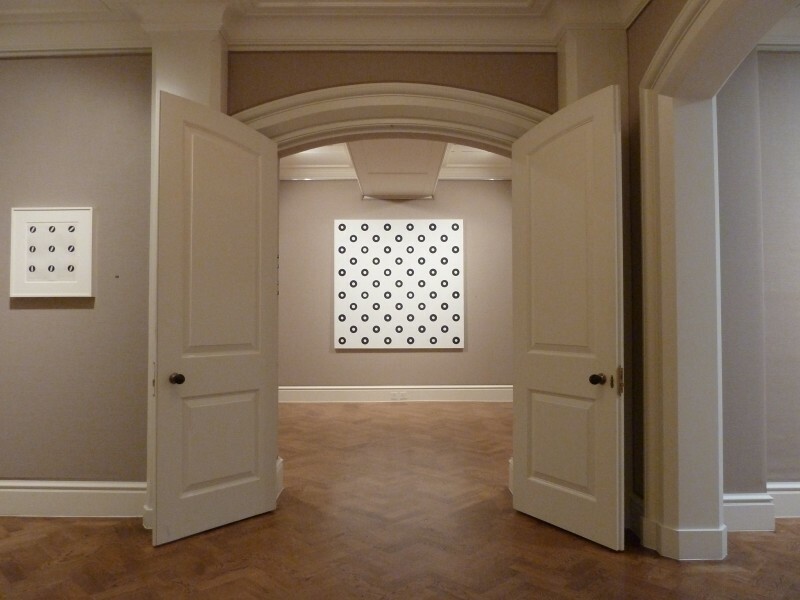 Bridget Riley: Works 1960 – 1966 was a two part exhibition of 45 works at Hazlitt Holland-Hibbert and Karsten Schubert . The exhibition was held at both galleries, Hazlitt Holland-Hibbert, 38 Bury Street, St James’s, London SW1Y 6BB and Karsten Schubert, 5-8 Lower John Street, Golden Square, London W1F 9DR. Many of the pictorial strategies that she set out in quick succession during those six years have remained influential on her subsequent work, with visual instability and spatial ambiguity recurring as themes throughout her career. The uniqueness of her position was quickly recognised and by the end of the 1960s she represented Britain at the Venice Biennale. She was the first British artist (and the first woman) to win the coveted Painting Prize. Riley’s paintings from the 1960s are amongst the most iconic images of the period. Riley, to this day, has remained a much-admired role model for subsequent generations of artists. Her work has been exhibited in museums and galleries all over the world. In 2008 she was the subject of another major retrospective at the Musée d’Art Moderne de la Ville in Paris. Works from the 1960s were last on view in her Tate Britain retrospective in 2003. The exhibition will be accompanied by a fully illustrated catalogue, priced at £20, with three major historic essays: two interviews from 1967 with Maurice de Sausmarez and David Sylvester respectively, and ‘Perception is the Medium‘ (1965), a manifesto-style text in which Riley sets out her artistic position with the clarity for which all her writing since has become famous.